The placer gold was first discovered in September of 1898, and by the end of the same year the creek had been staked between the coastal plain and Nekula Gulch. The discovery created a gold rush in the area, this led to the establishment of Nome (originally referred to as Anvil City) as many people begun relocating to the area. Anvil Creek is well known for the largest gold nugget ever discovered on the creek. 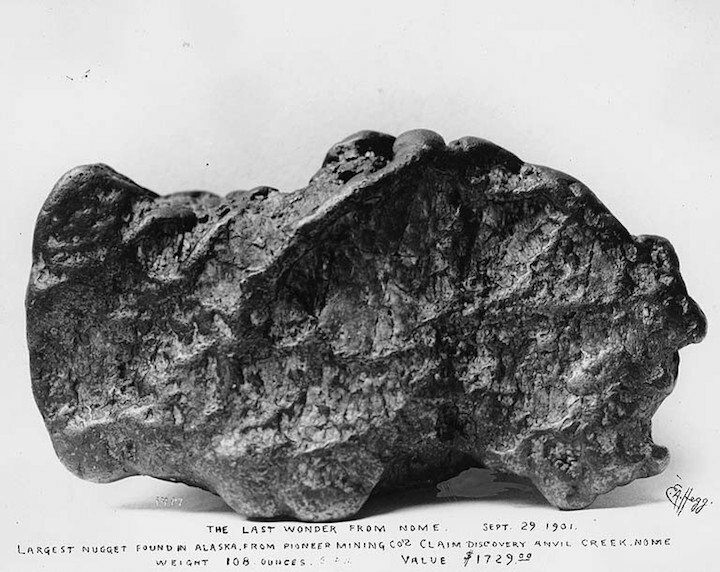 In fact, until the more recent discovery of the Alaska Centennial Nugget, the biggest gold nuggets in Alaska had all come from Anvil Creek. It is said that after the discovery of the largest gold nugget, more placer gold were discovered and about 100 ounces of gold is believed to have been extracted on the creek following the larger nugget discovered earlier. However, the serious and intense mining of the nuggets weighing in the range of 20 to 25 ounces are known to have commenced in 1899. 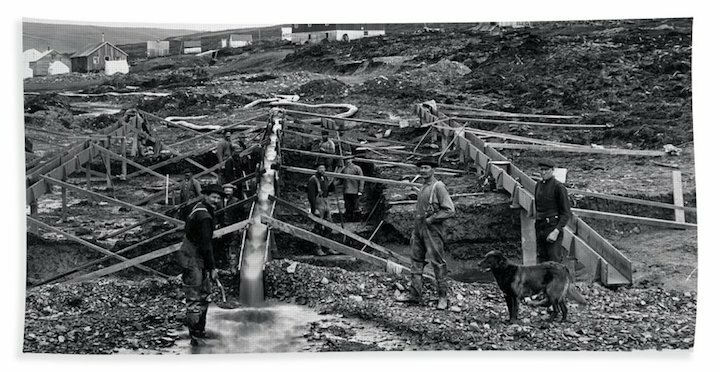 By the year 1900, the placer gold mining rose to 85,000 ounces. As the year 1900 was coming to an end the production from this one creek had risen to 145,000 ounces. All of this gold came from the rich placer deposits in the gravels. The gold mining became so intense that by the year 1902 the placer gold on the valley bottom was almost entirely played out. On the other hand, in the lower canyon the width pay, ranged between 50 feet to about 500 feet above Specimen Gulch respectively. Then the pay gravel was about 3 to 5 feet in thickness below a thin cover of clay and muck. 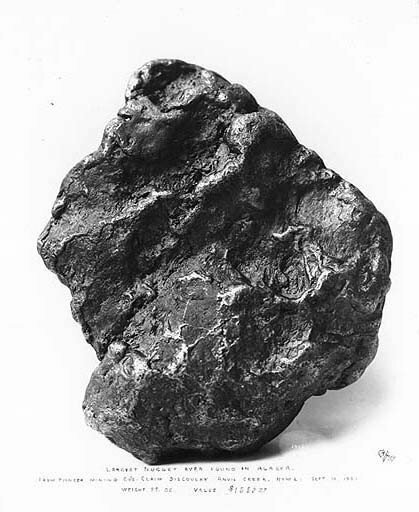 The single largest gold nugget discovered in 1903 and weighed in at 182 troy ounces. It is also said that most of the gold occurred throughout the gravel about 1 to 2 feet right on the top of the bedrock. More bench deposits were extracted on the east side of the Anvil Creek. Most of the gold to come from Anvil Creek was extracted using small-scale methods during those early days. Eventually, when production was increased other methods of extraction such as hydraulic methods were used, which included hydraulic elevators and mechanical-hydraulics which were used interchangeably as well as the steam shovels in carrying out mining operations. In 1922, dredging was introduced on the sites that were previously mined by placer miners. Obviously this increased gold production on Anvil Creek dramatically. The dredge was able to work deeper gravels and extract large nuggets from bedrock deep below the surface. By this time, the height of gold mining in Nome and the surrounding area was long over. The beach sands had been depleted considerably in those few decades, and only a small population of miners remained to prospect this remote area. Dredges helped to increase gold production considerably. The placer gold on the Anvil Creek is reported to have originated from different locations, which included some mineralized bedrocks on Banner Peak, the saddle between Anvil Creek and Snow Gulch as well as Bonanza Hill. Other places that were rich in placer gold included high-level placers which were located close to Nekula Gulch at the head of Anvil Creek. The other rich bench deposits were extracted from the east side of upper Anvil Creek. More gold was mined in the bowl that was located between Nekula and Specimen Gulches. Other sides that were mined on the east side included the virgin bench deposits, which were extracted by open-cut methods. Another noteworthy chunk of gold discovered here was a gold quartz specimen which contained about 129 ounces of gold. Anvil Creek produced both solid nuggets and gold in quartz specimens. Anvil Creek holds a special place in Alaska history. In this great state with so much mining history. While it certainly isn�t the richest placer deposit in the state in terms of total gold production, there is nowhere else that has produced so many large gold nuggets. It is obvious that the Anvil Creek still has the potential to produce more gold to prospectors with focus and determination. Hopeful miners still venture up to Nome every summer, and some even explore Anvil Creek in search of a once-in-a-lifetime gold nugget. The creek has been mined hard over the century, but there are undoubtedly still some big nuggets yet to be found in this remote region of western Alaska.